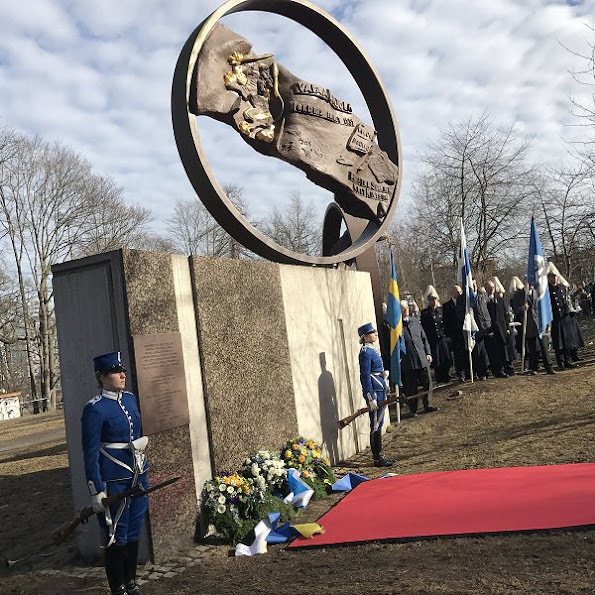 On March 13, 2017, Crown Princess Victoria, Prince Carl Philip of Sweden and Finlands president Sauli Niinistö attended a memorial service for Swedish Volunteer Corps (Swedish: Svenska frivilligkåren) at Finland Park in Stockholm. 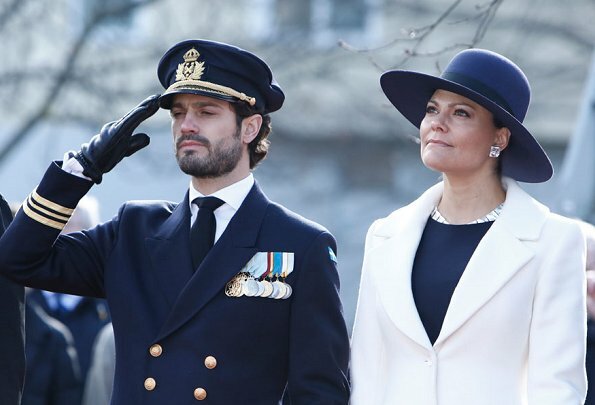 Crown Princess Victoria and Prince Carl Philip met with the President of Finland at the Finnish Embassy in Stockholm. She looks lovely. 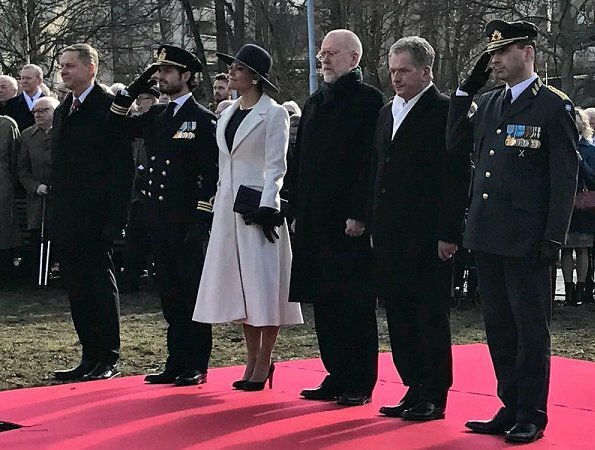 The hat suits her, as does the navy/white combination. This woman is already a good Queen. That's what I thought when I saw the pictures, she is indeed a queenly appearance. Maybe Carl Gustav will hand over quite soon at his daughter. Maybe the socalled two months holiday was not a holiday but a time to prepare for the new steps. Because since she is back I notice a shift in the way she is representing herself. 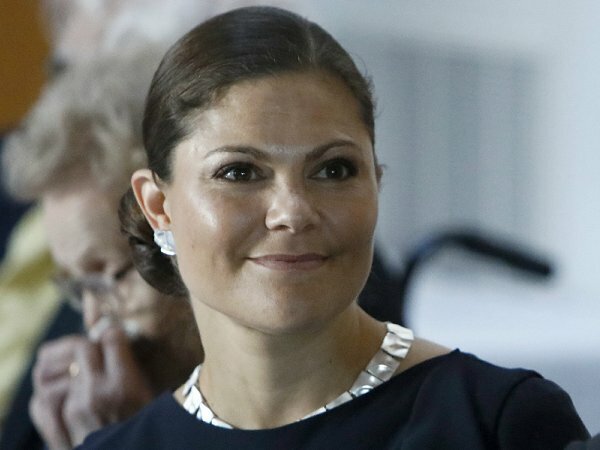 She seems to act no longer als Crwonprincess but as fully acknowledged stateswoman. I doubt it Beth, CG has made it very clear to the press that he will never abdicate, and will be king until he dies. Victoria looks beautiful. i love the hat. it suits her. Not a big fan of this outfit. I agree, I don't like the big white coat. The dress is lovely however. Exactly my thoughts. The dress is nice though. She really looks fantastic but the hairstyle is so boring. Love the coat and the dress. Very elegant. I realy do not like the outfit with the white coat. 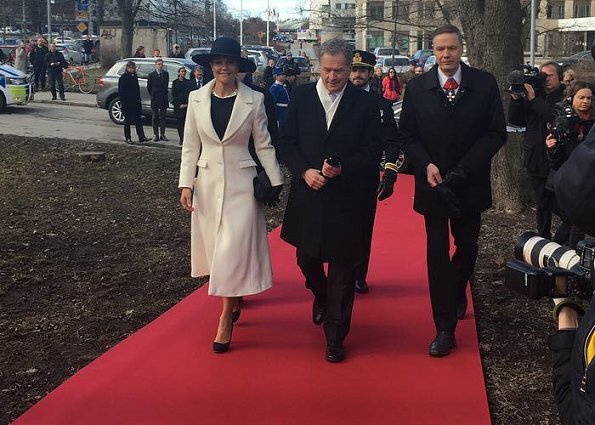 There is too much white and the outfit looks messy (can be because of the ill-fitting of the coat). There is definitely something wrong with that outfit. The first one is gorgeous. Why do you call it ill-fitting? It fits perfectly, shoulders, sleeves, bust, waistline, hips, it couldn't fit any better, it is modelizing her body. Maybe you think it is too long? Well, but this cut has a forties approach, with its deep collar, the patch pockets, the flared skirt, the hemline that ends mid calves. It is perfect and beautifully tailored. 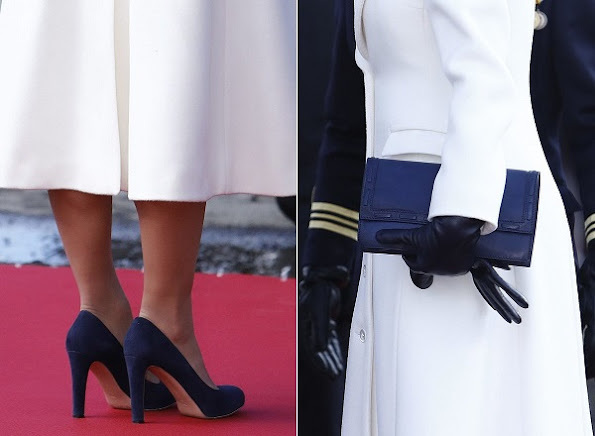 And she combined the right accessoires, wide rim hat, leather gloves, clutch, shoes with a slight plateau and a broader heel. Pefection! I am sure Victoria has a good eye for fashion herself and knows how to wear it but I am also sure she does have very good stylists. I think the coat is perfect, for the occasion. The coat is subdued yet fashionable. Great choice!